Not sure how I managed it, but my luck did not run out with regards to the snow riding, the streak continued this week. The flurries they were predicting for Wednesday changed to a snow prediction that wound up giving us 4 inches of fresh, dense, sticky snow. I'm not sure what the weekend will bring, temps are predicted to be warm, we might be slugging it out in some slush. Rain was also predicted but it looks like that possibility has all but disappeared. I'm going to get out tomorrow and assess the situation for Sunday's ride. Stay tuned for a trail report. But back to Wednesday. Boy was I happy, but not everyone around here seems to be digging the winter weather. We had a total of 5 riders out on the night ride, far smaller than usual. For the past couple of months I've been hearing grumbling from more than a few people that they want warm weather. Hey kids, this isn't Alaska, it's not that bad. Embrace it! Dry dusty trails and 80 degree weather would get boring if that's all you rode everyday! Too each their own though. The ride was definitely a workout and everyone did their fair share of walking on the steep uphills. The more moderate climbs were manageable with determination and a lot of weight shifting and body English to stay on track. Some places had a nice layer of ice underneath too which kept you on your toes. It was cold but another beautiful night to be out on the trail. The snow that fell seemed to have more reflective qualities than usual and the bike lights made the ground twinkle like a million stars had fallen from the sky. Heck, the views alone in these conditions are reason enough for me to get out and ride this stuff. I've been running some fairly low tire pressure in the deep snow, usually around 60% of what I run normally. On this ride I dropped the pressure, but didn't have the benefit of a pump or gauge at the trailhead, so I just guessed. Well, seems I went too low and had a string of 3 flats in quick succession. Big thanks to everyone for their patience and the spare tubes. Hopefully I'm done with that for a while. Don't forget everyone, daylight savings time is this weekend. Three weeks earlier! The days are already getting longer, this is only going to make everyone happier for the post work riding. Friday I was all set to declare an end to the snow riding streak. It has been a good long run, I lost count how many I got in a row, but it was well over a dozen. That's unusual for these parts, because when we get snow it will usually linger for a few days to a week and then melt off and be gone. Or we'll get a big dump that is too deep to ride a bike in. But this winter has been different. Part of it is that I can now ride Gambrill and the Watershed anytime I chose and the environment up on that mountain ridge is just different. Colder and prone to keep the snow around longer. The other reason is we got snow and it stayed cold. Then we got more snow. Then snow, sleet and freezing rain that put 6-8 inches on top of what we had. When it froze the little pellets that fell from the sky formed a textured crust that resemble concrete. It was surprisingly grippy and if you ran studded tires like me, you became nearly invincible. Riding was fast and sweet on this frozen tundra, but you could no longer see the trail, just a vast white landscape, so you really needed to focus on staying on course. If you didn't know the trails you were SOL. 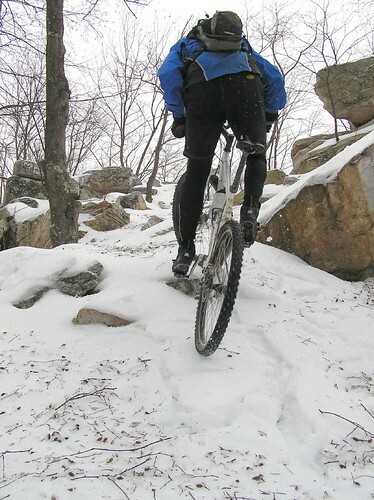 Once the magic crust started to give way when temperatures warmed, I figured the snow riding was over. But no, we got another big dump of 6 inches of snow, so I was back out playing in it once again, just like a kid. This weekend though, it looked like things were done. There was still snow on the trails, but it had turned to wet, heavy slush that created conditions that were far from optimal. So the plan was to head out on some of the gravel roads in the Watershed Saturday and get some riding in anyway. We had a group of six slated to go, but by the time we were ready to leave in the morning 3 had bailed. On the way up to the meeting spot we passed Nick and Jim at one of the parking areas. That had driven a long way in hopes of getting some trail riding in only to arrive to crap conditions. That tagged along and we now had a group of five. The gravel roads were wet and sloppy, spraying you with a grayish spatter reminiscent of Paris Roubaix. We got massive rain a couple of days earlier and the big melt off was continuing to go down. In between the stretches of dirt, water and mud the gravel roads were still covered with snow and ice. The forecast was for a high of 49F but it was way colder than that and consequently 3 of us were quite underdressed. By the time we were halfway done the 4 mile climb up from Mountaindale reservoir it started to rain, then sleet, then snow big huge flakes the size of cotton balls. 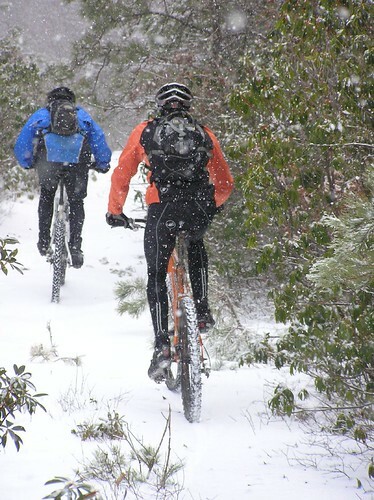 That kept up for a while, then faded to flurries and then when a few of us decided to test a section of trail on the way back to the car the big snow flakes cranked back up to full force. We slugged it out on a 1 mile section of singletrack that had 4 inches of slush and made you feel like you were towing a 50 pound weight. On Sunday I returned solo, traded the fixed MTB in for the fixed Crosscheck and gave it another go. An earlier morning dusting left the roads covered with a small layer of snow that hid all of the ice patches you could see the day before. More melting, but things were not nearly as wet. Sections of the road have been torn up and rutted from the heavy rains and melt off and the skinny tires made it real interesting. Colder than Saturday and plenty windy, it was still a good ride. So, the snow riding wasn't over, but I have a feeling the streak may truly be done now. We'll see though, Wednesday is the next ride on the books and an Arctic front is moving in tonight. Current forecast is for flurries sometime on Wednesday, so anything can happen. And a quick news flash: Dirt Rag editor Michael Browne is moving on. He had some tough shoes to fill when he came in to replace the original editor and co-founder Elaine Tierney, but he did a great job. Best of luck in the new gig!